From the moment Stan Lee and Steve Ditko first created Spider-Man, a wet-behind-his-ears superhero shackled with great power and great responsibility, all the way back in the 1960s, one of the recurring themes of Spidey’s saga is the ways in which Peter Parker juggles his dual identity. By day, he’s a whip-smart student cramming to pass his exams, but by night, he’s a masked vigilante who helps to tackle crime on (and indeed above!) the streets of New York City. It’s a wildly entertaining juxtaposition that isn’t lost on writer-director Jon Watts, who is the man behind next month’s Spider-Man: Homecoming. Angled to be a franchise reset, Homecoming is all set to become the sixth Spidey movie in 15 years – for what it’s worth, the creative team involved believe the Tom Holland-fronted actioner is the first, true Peter Parker movie – and though many feared Marvel’s Web-Head was circling the jaws of franchise fatigue, with each new promo that’s released online, our excitement for Spider-Man: Homecoming continues to grow. The latest media dump arrives in bulk, as these things tend to do at this stage in the release cycle, and here you’ll see Tom Holland’s Parker struggling to maintain his secret identity from prying friends and Aunt May (Marisa Tomei). There’s also an Audi commercial that places Parker behind the wheel to hilarious results, while artist Matt Ferguson has delivered what is arguably one of the greatest Homecoming posters to date. Feast your eyes on the one-sheet, below. 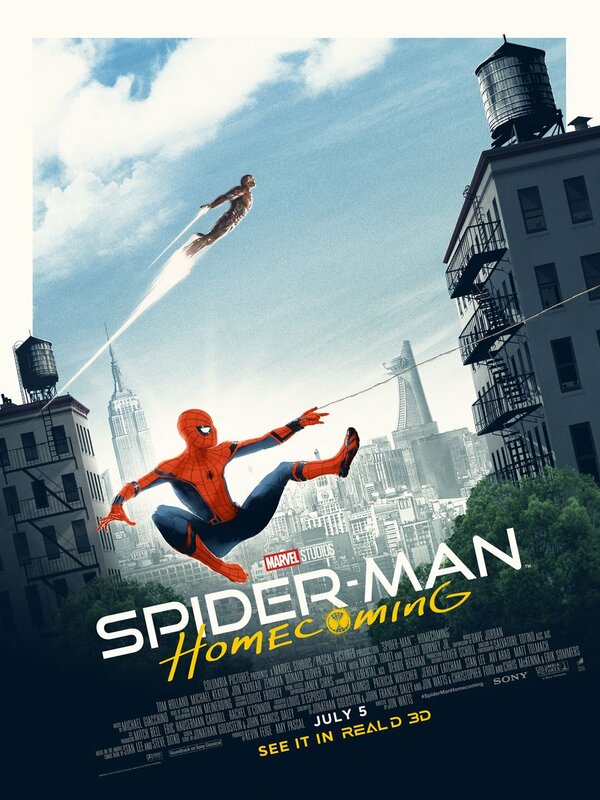 Spider-Man: Homecoming scurries into theaters on July 7th, and as this is another Marvel movie, you’ll want to hang around after the credits roll for multiple (?) scenes. Last month, James Gunn’s wildly successful Guardians of the Galaxy Vol. 2 came packing a whopping five post-credits stingers, so it remains to be seen whether Jon Watts’ reboot will follow suit.